I love the Victorian era. So I decided to live in it. Apparently this article caused a kerfuffle when it first came out? I dunno, I unironically loved it. Yes, the tone comes off a bit condescending at times. Yes, I’m sure there are many, many ways they are still benefiting from the advantages of the 21st century — how did the author write this blog piece, after all, without a computer? But I would love to be able to do this for a few days, a week, a month — just to get a taste of an era I find fascinating. Friendship’s Frequency. This rang very true for me. I have been Busy Betty in many friendships, and I’m still learning how to manage the thinly-cut slices of my social pie. – Submitted “Remember to Die” to Shimmer (yeah, I know, flash is a hard sell with them — see below for my inevitable rejection. I tried because I read Rachael K. Jones recent flash story and was like, hmm, okay, that’s sorta the same thing I’m trying to do. It was not). 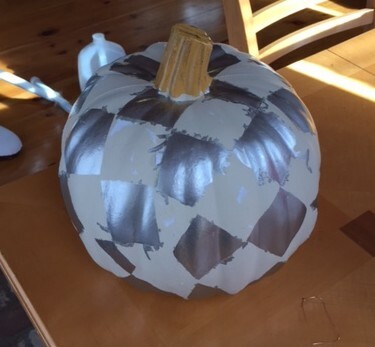 – Painted a checkered pumpkin à la this tutorial, which turned out… well, judge for yourself.